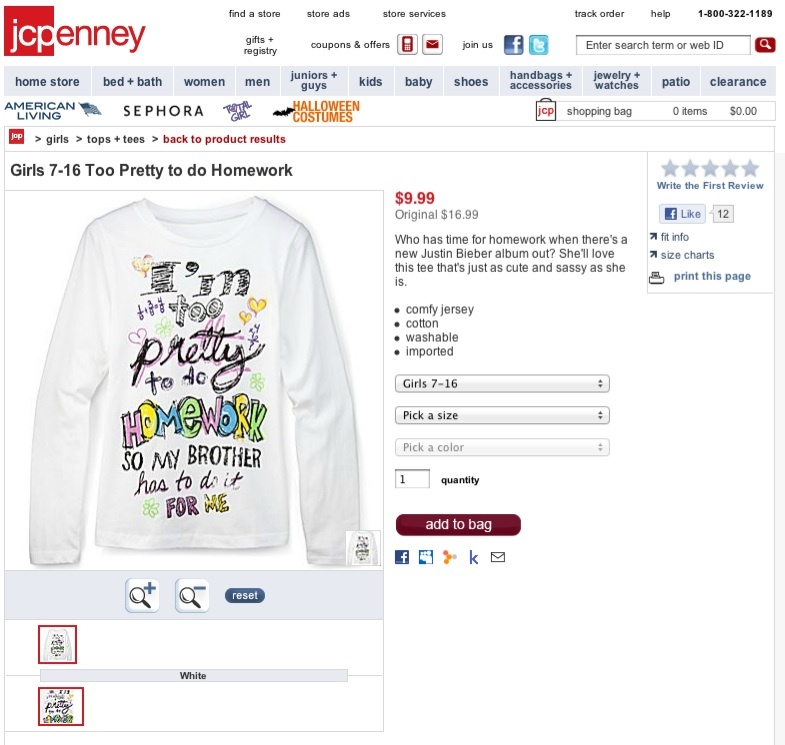 JC Penney: Undermining Girls’ Education Since 2011. We can all agree that selling a t-shirt for girls ages 7 to 16 emblazoned with “Too Pretty to Do Homework, so my brother has to do it for me” is a terrible, terrible idea, right? (With the caption “Who has time for homework when there’s a new Justin Bieber album out? 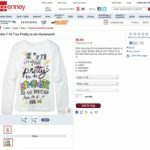 She’ll love this tee that’s just as cute and sassy as she is.”) The problems with that shirt (setting aside its awful design) are many — tying appearance to the need to do homework, suggesting getting a boy to do it for you. Just terrible. If you’ve been following the show on Facebook, you might have guessed that the next release from Spare the Rock Records will be connected to girls’ education (not yet ready to fully announce it, but soon), and this is exactly the sort of message that is damaging. And gets me really, really angry. I intend for this shirt to be a prime example of exactly what we need to do better in messages to our daughters. JC Penney won’t be getting our back-to-school shopping. Or any other shopping. You can contact JC Penney here. I did already. Update: It looks like they’ve taken it down. Good on them as a first step. How about an acknowledgment that it was a terrible, terrible idea? Publicly? Screenshot of what it was is above; click on it for a full-sized view. Update 2: They’ve apologized, and in a pretty straightforward, non-“we-apologize-if-you-were-offended” way. Good on them. Listen on-demand at our page at WRSI.com! Kevin Kammeraad/ScribbleMonster – The Fur Trade? Dan Zanes & Shine – Wake Up Baby! Nields – Who Are You Not to Shine? Listen on demand any old time at our page at WRSI.com! Stan Ridgway – Wondered What It’d Be Like? Me 3 – I Don’t Know! Miss Gail & the Jumpin’ Jam Band – Hey! Hey!